Take pumpkin and cut off top. Slice in half and scoop out the insides, reserving seeds for roasting. 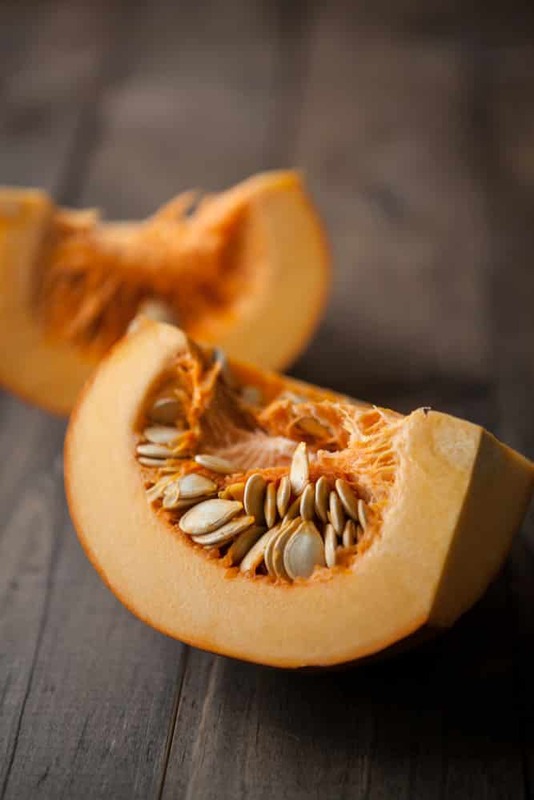 Cut each side in half and from there, cut each quarter of pumpkin into 1″ strips. Continue to cut pumpkin in to 1″ cubes and slice off shell on each piece. Cut pumpkin pieces in to 1/2″ pieces. Dice the onion and toss with 2-3 cups pumpkin and olive oil. Roast for 20-25 minutes or until pumpkin is beginning to brown and is tender. While pumpkin roast, stir together ricotta, egg white, salt, and pepper. Set aside. Bring a pot of water to a boil and cook lasagna noodles until tender. In a small sauce pan, heat butter over medium-low. Once melted, whisk in flour and cook for 1 minute. Whisk in milk and continue to cook until sauce has thickened. Remove from heat and stir in blue cheese. 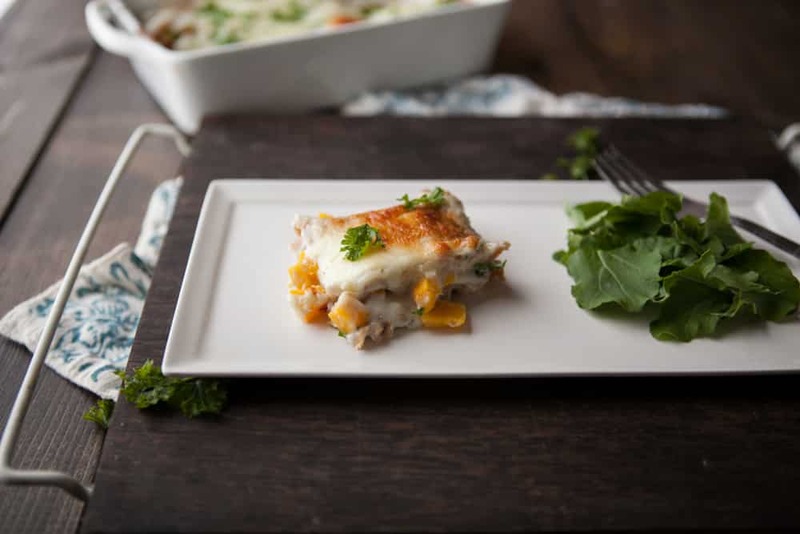 To assemble lasagna, pour 1/4 of the blue cheese sauce at the bottom of an 9 x 6 pan. Layer lasagna noodles on top followed by 1/2 the ricotta, 1/2 the pumpkin mixture, and another 1/4 of the blue cheese sauce. Repeat once more and for the final layer, add lasagna noodles, the remaining blue cheese sauce, and finish with mozzarella cheese. Bake for 20-25 minutes. Cheese on top should be lightly browned. 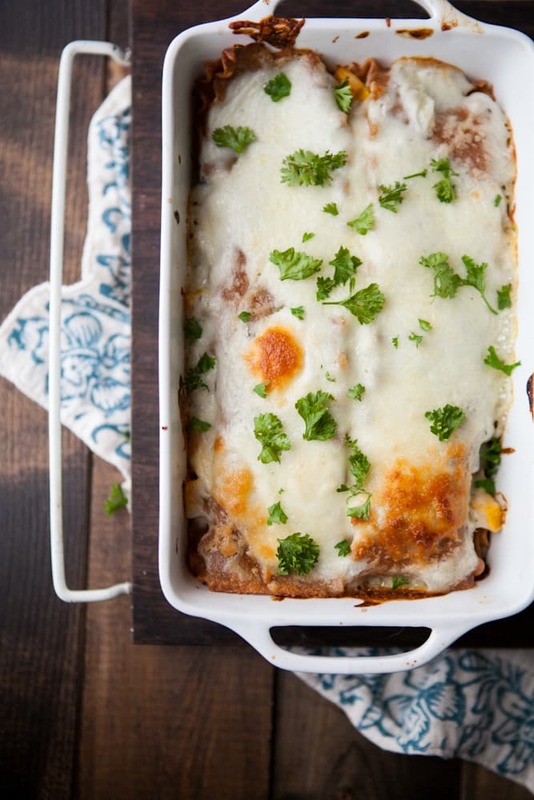 *I bought my 9 x 6 pan at Crate and Barrel (because it feeds 2 just right!) You can always do 1/2 times the recipe for an 8 x 8 pan- you should still only need one pumpkin. Now that is what I want to see… blue cheese and pumpkin. I have yet to come across this combination, but it is definitely one worth testing out. I just bought smoked blue cheese for the first time this weekend to serve with a buffalo chicken soup. What a great find! Gosh, this looks so delicious Erin. Heck yes! Love the sound of this! 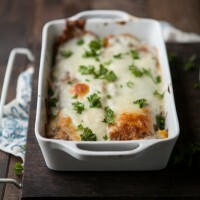 I am loving this recipe!! Erin – I am totally loving this combination – sounds fantastic! It would be miraculous if I found smoked blue cheese here, but I might try it with the regular sort as you suggest. this looks amazing. 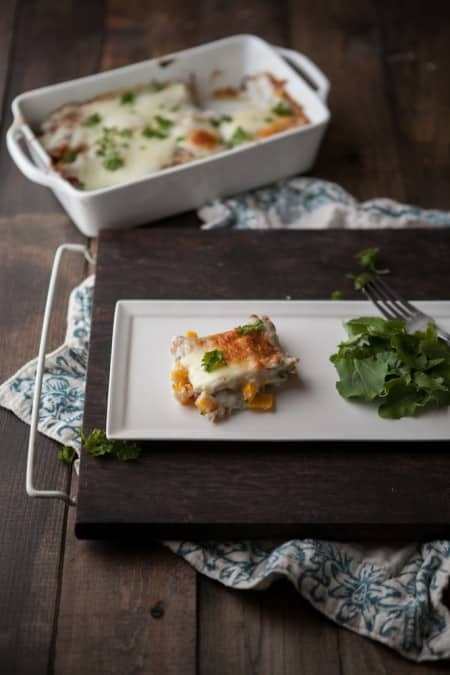 Such a creative spin on lasagna and your photos are just so stunning! This look delicious! 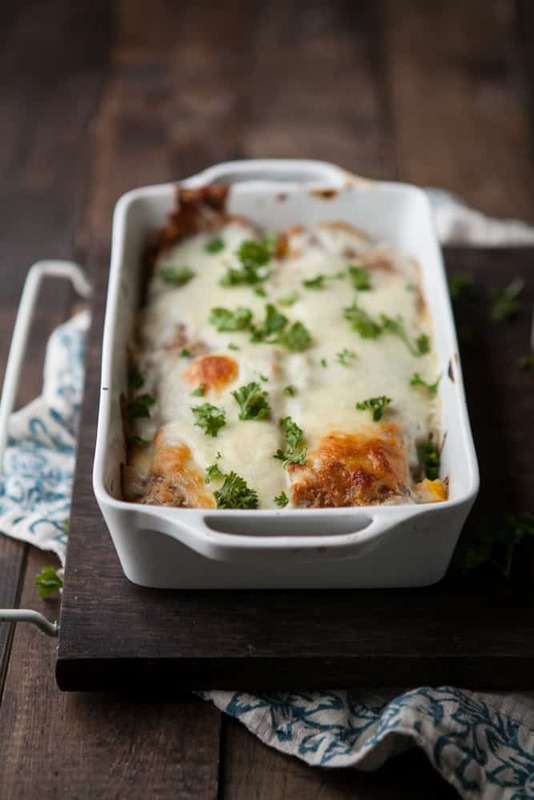 I wanted to let you know that I featured this great recipe in my “What I Bookmarked This Week” post today – stop by and see!! I cooked this on the weekend. It was so yummy! my boyfriend loved it too. will defiantly be making it again. thanks for the recipe. I’m not sure anyone on this site will see you as defiant – I think we’ll pretty much all be doing the same thing! 😉 Enjoy! I love that you made this wee-sized! I always feel daunted by lasagna recipes and the prospect of eating leftovers for days. This is genius. Can’t wait to try this veggie recipe! Made This Tonight, Delicious! I Added Pine Nuts. This looks really delicious. I am going to try this recipe tonight. Hope it turns good as this is my first lasagna.